Carter has 3 of these and wears one every day. They are the best because of the strap under his chin and they stay on! They are reversible, but he usually wears the plain navy side. When you have momma's fair skin and super blonde hair a good hat is a MUST!! Back to the fair skin...another must have! I like this because it sprays on and rubs in pretty quickly. The non-spray lotion is hard to rub in. This is much better! He has 2 suits from BabyGap (12-18 months) and they are my faves! But Gap didn't have rashguards that matched. Luckily I found Janie and Jack rashguards to match! I didn't think my boy would wear Crocs, but we got a pair of hand-me-downs and he wears them almost everyday (except school days). They are easy to put on and I like that we don't have to bother with socks. Just basic shorts that he has in a few colors. They seem super comfy and easy to wear, so if he is wearing other shorts I usually change him into these for nap. ***a little sidenote...I bought Carter some of the BabyGap cargo shorts with the elastic waistband in the spring in 12-18 months and they are HUGE!!! I thought that he'd grow into them, but he hasn't and they are just sitting in a drawer waiting to be worn. So, lesson learned don't order too far ahead of time. 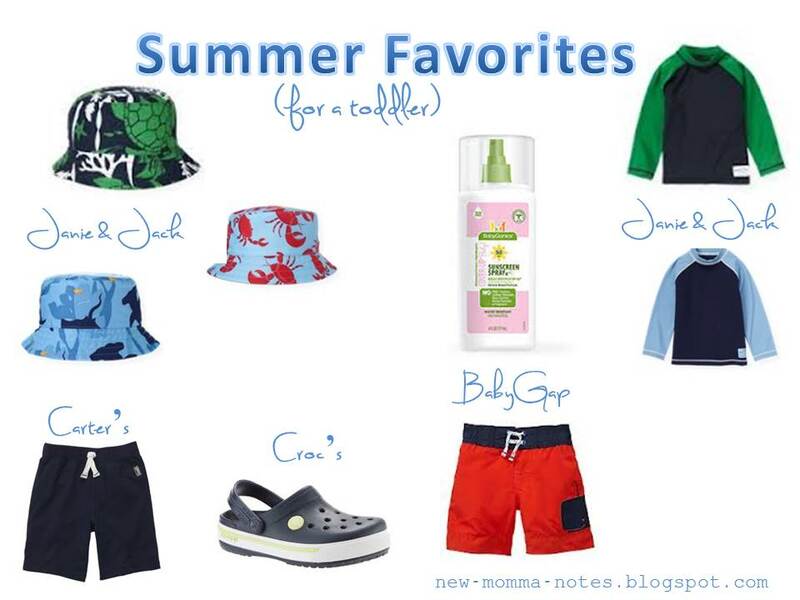 Here are my other "favorites"
Your blog is so cute!!! I love it! My son was born 04/23/2012 so our kids are the same age!! I love Carter's backpack!!! In the year of 2017. People around me suddenly begin to hang out with Bikinis.I'm feeling curious and suspicion at the moment:"Is this a thing now? "And here's my thoughts after research and the dress that I bought.